Right-click the clip and select “Slice to New MIDI Track.” Select “Warp Marker” from the “Create one slice per:” menu and “Built-in” as the “Slicing Preset.” Ableton will create a new MIDI track containing a Drum Rack; each slot in the Drum Rack contains a Simpler holding one slice of the drum loop. You can now mute or even delete the original drum loop sample that you loaded. Create a new, empty MIDI clip in the sliced track, then program in a sequence of MIDI notes. Each MIDI note will trigger a slice of the loop. To make it easier to hear which slice you’re triggering with any given note, click the little headphones icon in the upper-left corner to enable the preview. 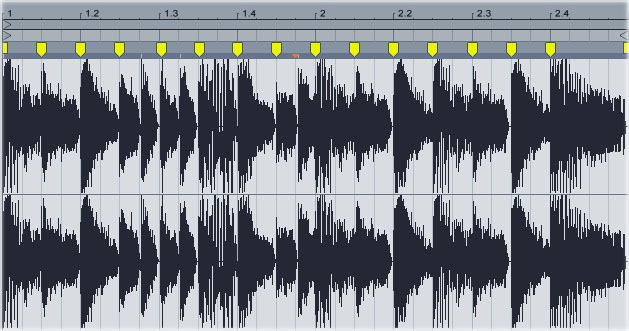 Whenever you click on a note field, Ableton will play the slice that the field triggers. Play the sliced track along with the MIDI drum loop that you previously created (you’ll probably need to lower the volume of the sliced track). If it sounds like the lower frequencies in the sliced track are conflicting with the kick drum in the MIDI pattern (as often happens), put a low-pass filter onto the sliced track. Because each slice within the Drum Rack is actually an instance of Simpler, you can alter any slice independently of the others. Let’s configure the last slice of the loop (slice 15 in this example) so that its pitch rapidly rises every time it’s triggered.